In 1995, when I was a mere 16-year old teenager, in the midst of the alternative rock craze, a song was released by singer-songwriter, Joan Osborne, entitled What If God Was One of Us (click on the link of the song to hear it and see the video). Though I am not sure if the song is somewhat mocking or not, it’s still a thought-provoking song. Of course, for Christians, we would say God has become one of us, literally, in Jesus Christ. We use the word incarnation to refer to this act of the divine Son of God becoming human to reveal the Father and accomplish His purposes. And, though every Christian holds to this great and important belief of historic, orthodox Christianity, I think it’s possible to simply hold to the belief so much as to allow our theology to line up with historic Christianity, but we keep it just enough at arms-length so that we miss a very important practical understanding of what it meant for Christ to be fully human. And I think this comes through greatest when we talk of Christ and the temptations he endured. No one can deny that Christ was tempted. To do so would be to deny the teaching of Scripture itself, noting the wilderness temptations (i.e. 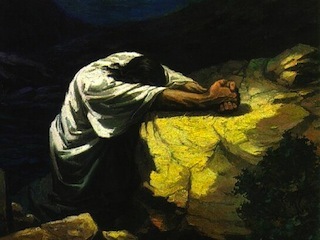 Matt 4:1-11) and passages like Heb 4:15 – For we do not have a high priest who is unable to empathize with our weaknesses, but we have one who has been tempted in every way, just as we are—yet he did not sin. And for those of the more sectarian-cult background who would point out Jam 1:13 as a kind of apologetic for why Christ has not always been the eternal divine Son, I think they are failing to grasp the real details of what the historic teaching on the incarnation. But that is for another place and another time. Having remarked that Christ is actually fully human and was actually tempted ‘in every way, just as we are’ (Heb 4:15), I believe we do a disservice if and when we let Christ off the hook with what he did endure as a human with regards to temptation. When the writer to the Hebrews teaches that Christ was tempted ‘in every way’, I don’t believe that means he went through every single particular instance that you and I have gone through. For example, he probably wasn’t tempted to smoke marijuana. But this first phrase, in connection with the second phrase, ‘just as we are’, would point to the reality, at least as I understand it, that Christ did endure actual temptation with regards to sin. I think it unhelpful to state that, a) because Christ was the divine Son then b) he was impervious to temptation as if he just simply blew it off as nothing. I see it as unhelpful because it seems to set aside all-important passages like Heb 4:15 where we read Jesus ‘has been tempted in every way, just as we are’. And I believe it also fails to fully consider the ramifications of passages like Phil 2:6-7, which in the NASB, we read this: who, although He existed in the form of God, did not regard equality with God a thing to be grasped, but emptied Himself, taking the form of a bond-servant, and being made in the likeness of men. The word emptied becomes very important here. Christ existed as the divine Son, i.e., he is eternally divine. But Christ did not grasp at his equality with God, but emptied himself of such privileges. The word emptied comes from the Greek word kenóō, which is found in Phil 2:7. This is where the idea of kenosis theology arises. And, as one might guess, there has been many a different opinions on how this emptying plays out. I, personally, do not believe the emptying here is in regards to the divine Son halting his actual divinity, thus only being human in his incarnation. I believe Christ, in his incarnation, and still today, was both fully God and fully human. And as the resurrected Lord, he now has a glorified body as we, too, will have one day. To give you another big theological term, this concept of Jesus being both fully God and fully human is known as the hypostatic union. So in the emptying, in the laying aside of privileges, I do not believe Jesus stopped being the divine Son. But I do believe he did empty himself of the privileges he would have had as the divine Son in human flesh. He was in a place of walking out what it meant to be truly human in reliance upon the Father and Spirit (i.e. John 5:19). Thus, Christ serves as the great example of what it means to be fully human as the Father intended. But I also reckon that it put him in a place, as Heb 2:15 makes clear, that he had to walk through actual temptation and all that entailed. And here is where people would deem me in dangerous territory, though at this point I am of the opinion that it is being faithful to what Heb 2:15 and the overall teaching on the incarnation. For temptation to be actual and real temptation, I believe there had to be a possibility that Christ could give into the actual and real temptation. Well, it gets down into a discussion on the nature of temptation, and especially the nature of temptation with regards to Christ. It centres around the theological discussion concerning the impeccability of Christ. Whether or not one believes Christ had the actual choice to give in to temptation, the Christian believes (should believe) very much that Christ never did actually sin. Thus, what we are dealing with here in this particular instance is whether Christ could have chosen to give in to temptation. But, while I agree 100% that Christ never did sin, so that he might be both the faithful high priest and faithful sacrifice for sin, I believe we answer this question from more of an anachronistic approach, meaning we answer it already knowing the final outcome. But for Christ to be fully human, and as Heb 2:15 says, to be ‘tempted in every way, just as we are,’ I believe he actually had to face the choice of saying yes or no to the temptations he faced, whatever temptations he faced. If that were true, I think temptation no longer stands as temptation for Christ, or for anyone. For temptation to be temptation, there must be a choice of saying yes or no. And just as the first Adam had the choice in the beginning, even in his sinlessness, so the second Adam (Christ) was faced with the same choice, even in his sinless nature. If there is no choice involved, as if the person could simply laugh it off as a silly concoction, then I believe temptation ceases to be temptation. But thankfully, where Adam failed, Christ came through, even when really tempted as to give in to whatever the enemy (or possibly life) threw at him. And so this is where I believe we can confess a belief in the incarnation, but only to a certain extent, not allowing for what it meant for Christ to be fully human and to be tempted in all things just as we are, yet without sin. Even more, this is where Christ’s high priesthood really means something to the believer. He understands, he can empathise with us in our weaknesses (also Heb 2:15) because he has actually gone through what we have gone through. But, he is different from us in that he was the victorious one over temptation, sin, death and the enemy! This entry was tagged Christ, incarnation, Jesus, music. Bookmark the permalink. This has been a very rewarding topic to study. Scott: As tough as it may be to reason that Christ’s temptations were like our own it does seem to me that you are correct in pointing out that this is exactly what Scripture tells us. Of course, it is merely a hypothetical question to ask, “Well, what if Jesus had sinned?” just as it is hypothetical to ask, “What if Jesus would not have been crucified?” I think we should accept at face value what you said: in the incarnation the Word of God was made flesh, therefore a real human, therefore a human who faced real temptation. Scott, I affirm the same at every turn. But I see a difference between the flesh of Jesus and the rest of us. His was uncontaminated, if you will. But I do agree that he had to say “yes” or “no,” like the rest of us. I believe this is clear from Paul and the Hebrew writer’s stress on Jesus’ obedience/righteousness. I never really ponder much about what if Christ had sinned. I think I ponder more about could Christ, as a real human, be involved in real human faults, except for sin? For example, could he have missed a math question, could he have stubbed his toe, could he have misplaced his hammer and forgotten where it was, etc. I believe Christ was perfect, in that he was sinless, but I also wonder if his limitations were more similar to ours in that, in emptying/laying aside his rights to his divinity, he laid aside his omniscience as well. I would lean towards yes, because of his absolute dependence on the Father/Spirit, and this complete dependence coming through even in his teaching. But I would believe, since he only spoke and did what the Father wanted (in regards to revealing the Father and the kingdom), he therefore spoke all truth on such specified matters. But Christ did not come to reveal such things as mathematics, astronomy, etc. Hence, in his laying aside omniscience in his incarnation, he could have spoke of an ancient near east cosmology or missed that math question in class and not got an A+. It is simply ponderings. Some see this as dangerous. But it is something I think about. Scott, I don’t think he laid aside any divine attributes, if by laying a side we mean he no longer was omniscience, omnipotence, or omnipresence. That is after all what the early proponents of the Kenosis Theory argued for. Again, as I see it Jesus was always fully God, therefore omniscience, omnipotence, and omnipresence. But he never took advantage of his own divinity to help in any way that would alter him from living his life as fully human. So how did he do what he did? Well you already alluded to that by “his absolute dependence on the Father/Spirit”. So, Jesus never stopped being God. But he emptied himself of his rights to grasp on to his divine attribute. Therefore, Jesus functioning in his earthly life did not have all knowledge. He could have drawn on all knowledge. But he didn’t have it. Thus, he drew on his Father to teach, give revelations, prophecies, words of knowledge, etc. Scott, exactly. That’s what I thought you meant, just wanted to be clear (if for nothing else the silent readers). Maybe you could flesh that statement out, especially as you read my comment to Brian above. Lk 22:43 An angel from heaven appeared to him and strengthened him. Luke 22:42 is perhaps the most vivid and poignant record we have of Jesus’ struggle between his humanity and his deity. He had a choice to allow us to go to our death. Aside from all theology, rational thought tells us that had Jesus not suffered real temptation with a choice, his “perfect sacrifice” would have been just a charade and worthless for redemption.